S I G N & D I G I T A L G R A P H I C S • March 2019 • 137 LAWSON SCREEN & DIGITAL PRODUCTS Manufacturer in DIGITAL PRINTING/FINISHING EQUIPMENT, SCREEN PRINTING EQUIPMENT/ SUPPLIES, SUBLIMATION EQUIPMENT/SUPPLIES, TRAINING/EDUCATION COMPANY SAYS: Lawson is your complete screen printing and DTG equipment company. Lawson offers you a complete range of screen printing machines from simple manual silkscreen presses to advanced, easy-to-use automatics and DTG printers and pre-treat sprayers. 5110 Penrose St St Louis, MO 63115 http://www.lawsonsp.com 314-382-9300 LEDMODULES.COM Manufacturer/Distributor in CHANNEL LETTER SYSTEMS, ELECTRONIC SIGNAGE (LED/NEON) COMPANY SAYS: We offer industrial quality LED sign modules and power supplies. All of our products are UL or Ru listed. LED channel letter modules, LED box sign modules, RGB modules and LED controllers. 7000 N Fwy #200 Houston, TX 77076 http://ledmodules.com 813-516-8868 KPMF USA Manufacturer in FILMS, MEDIA/LAMINATES COMPANY SAYS: KPMF offers a wide range of wrap film colors and types that include premium cast colors, special effects iridescent, pearlescent plus a signature range of specialty over laminates. KPMF films offer ultra high gloss and one-of-a-kind matte finishes. 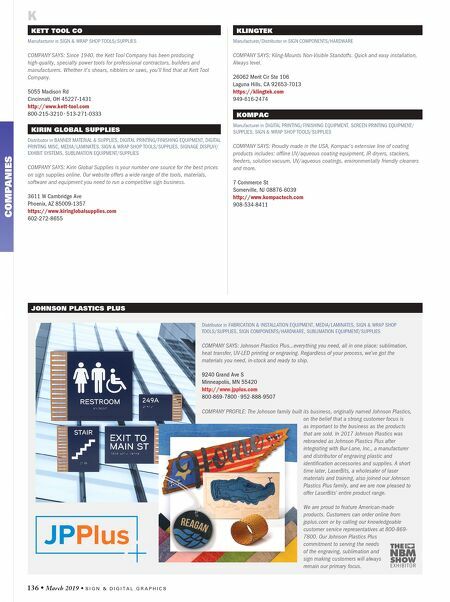 67 Kay Industrial Dr Lake Orion, MI 48359-1832 http://www.kpmfusa.com 248-377-4999 LAGUNA TOOLS Manufacturer in CHANNEL LETTER SYSTEMS, CNC ROUTERS (XYZ), DIGITAL PRINTING/FINISHING EQUIPMENT, FABRICATION & INSTALLATION EQUIPMENT, SCREEN PRINTING EQUIPMENT/ SUPPLIES COMPANY SAYS: For over 32 years, Laguna Tools has been a supplier of high-quality products for the woodworking, metalworking and sign-making industries and the home hobbyist. 2072 Alton Pkwy Irvine, CA 92606-4905 http://www.lagunatools.com 800-234-1976 • 949-474-1200 K-L KERN LASER SYSTEMS Manufacturer in FABRICATION & INSTALLATION EQUIPMENT, LASER ENGRAVERS COMPANY SAYS: Kern Laser Systems was founded in 1982 by Gerald Kern, with the main objective to design and manufacture top-quality industrial laser cutting and laser engraving machines to meet demanding production schedules. 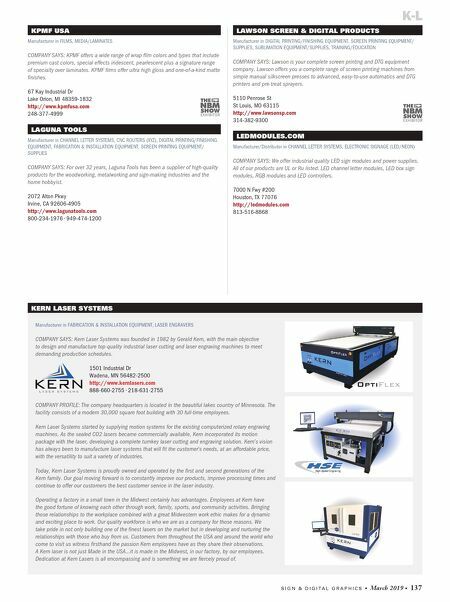 1501 Industrial Dr Wadena, MN 56482-2500 http://www.kernlasers.com 888-660-2755 • 218-631-2755 COMPANY PROFILE: The company headquarters is located in the beautiful lakes country of Minnesota. The facility consists of a modern 30,000 square foot building with 30 full-time employees. Kern Laser Systems started by supplying motion systems for the existing computerized rotary engraving machines. As the sealed CO2 lasers became commercially available, Kern incorporated its motion package with the laser, developing a complete turnkey laser cutting and engraving solution. Kern's vision has always been to manufacture laser systems that will fit the customer's needs, at an affordable price, with the versatility to suit a variety of industries. Today, Kern Laser Systems is proudly owned and operated by the first and second generations of the Kern family. Our goal moving forward is to constantly improve our products, improve processing times and continue to offer our customers the best customer service in the laser industry. Operating a factory in a small town in the Midwest certainly has advantages. Employees at Kern have the good fortune of knowing each other through work, family, sports, and community activities. Bringing those relationships to the workplace combined with a great Midwestern work ethic makes for a dynamic and exciting place to work. Our quality workforce is who we are as a company for those reasons. We take pride in not only building one of the finest lasers on the market but in developing and nurturing the relationships with those who buy from us. Customers from throughout the USA and around the world who come to visit us witness firsthand the passion Kern employees have as they share their observations. A Kern laser is not just Made in the USA...it is made in the Midwest, in our factory, by our employees. Dedication at Kern Lasers is all encompassing and is something we are fiercely proud of.